The Maryland Terps Ran Away from the Bison Today Including this second half burst by Kenneth Goins Jr. 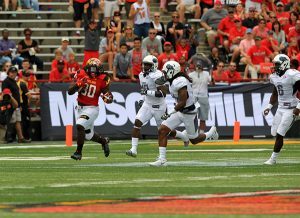 If you were looking for that bang, zoom, zam in a college football game, today was your game if you were a Terps fan. If you had Howard, well then you might as well have left before halftime with the goose egg on that scoreboard that stayed until late in the fourth quarter. Maryland quarterback Perry Hills went 14-for-19 through the air for 126 yards and no interceptions. He did his job until freshman Tyrrell Pigrome replaced him as the game got even further out of hand in the second half. Hills only had one carry on the day, but with the way the running backs were performing, that part of his game wasn’t needed. Before Max Bortenschlager came and replaced him, Pigrome led the team straight down the field, following up two 25-yard throws to DeAndre Lane with a 3-yard touchdown run to make it 42-0. His speed and agility are just electric. Jake Funk punched in another one in the fourth quarter to put an exclamation point on the game for the Terps, making it 52-6. The numbers really say it all about this game. Howard one just one game last season and was defeated by Boston College, 76-0. So perhaps it was just a payday for the Bison, who the Terps paid $325,000 to play this game today, in what may have been the biggest setting they will see all season long.